The fourth generation Mercedes-Benz A-Class offers an even stronger proposition to buyers in the premium compact hatch segment. If you define luxury in terms of technology, you're going to like it a lot. The engines are all new this time round and one of them is the 1.3-litre petrol unit we decided to test in the A200 variant featured here. 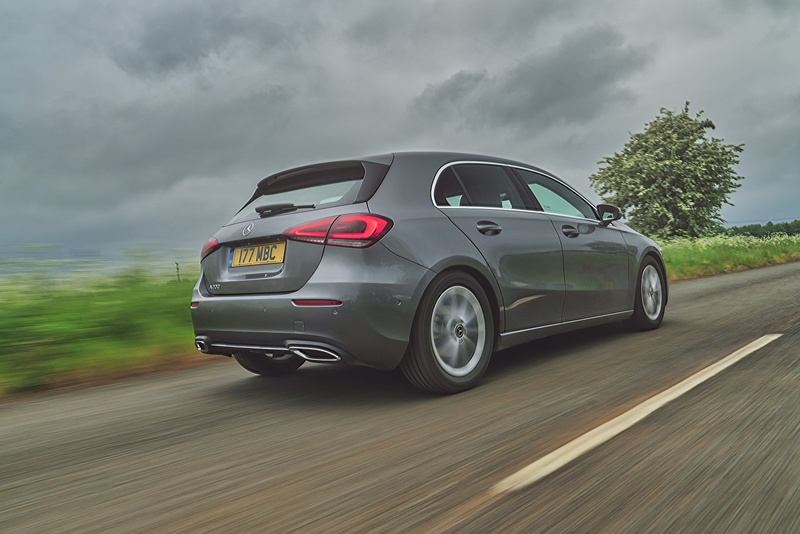 This fourth generation A-Class model, according to its maker, 'completely refines modern luxury in the compact class' - quite a claim. The brand thinks that this 'modern luxury' is now partly defined by technology, so that gets a key focus thanks to the introduction of a completely new 'MBUX' ('Mercedes-Benz User eXperience') infotainment set-up, built into sophisticated cabin design that instantly makes rivals look dated. There's an all-new range of efficient petrol and diesel engines too, all of it sat on a fresh 'MFA2' platform that will underpin a whole future generation of compact Mercedes models. This makes possible the 30mm wheelbase increase needed to release extra cabin and luggage space. Plus there's autonomous driving tech, a new era of headlamp technology and another step forward to terms of safety provision. This then, is the compact hatch that Audi and BMW feared Mercedes might build. But both will be developing products to beat it. What kind of benchmark will this A-Class set for them to aspire to? 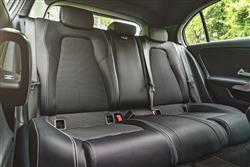 Let's find out at the wheel of the popular 1.3-litre A200 petrol variant. 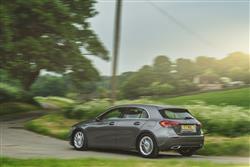 This fourth generation A-Class builds on the sporty-handling legacy of its predecessor. We don't think the 'Direct-Steer' steering system's quite as feelsome as it was before, but it still enables you to place the car where you'd want through the curves and really enjoy this Mercedes if you're a keen driver. Body roll's kept well in check and you're favoured with prodigious grip that's impressively untroubled by mid-corner bumps. Thanks partly to this model's slightly longer, slightly more sophisticated MFA2 platform, ride quality is a match for the premium segment competition - but could be better. And would have been had Mercedes not decided to equip all mainstream variants with low-cost torsion beam rear suspension rather than a more sophisticated multi-link rear set-up. As for engines, well the popular versions get engines developed by Mercedes in conjunction with its European Alliance partner Renault. As before, there's a 116hp 1.5-litre diesel for the popular A180d derivative - or a couple of 1.3-litre petrol units: either the 136hp engine fitted to the base A180. Or the variant we've decided to try, the 163hp A200, which features cylinder deactivation technology. That's with a manual gearbox, but it's the 7G-DCT automatic that most buyers will probably choose. This self shifter improves the 0-62mph sprint time slightly to 8.0s. In profile, this model is visually extended by its longer wheelbase and a sharp character line that runs from nose to tail below the glass house. The wing mirrors are now mounted mid-way along it, rather than being integrated into the windscreen pillar, and the bonnet slopes down more heavily than it did with the previous car, emphasising what Mercedes hopes is a more dynamic, upright front end. The real story here though, is what lies within. Sure enough, it'll be like nothing you've ever previously sat in when it comes to a car of this class, the key change being the lack of the kind of cowled instrument binnacle that almost every other car on the market has to have. Instead, two elongated square colour TFT screens are provided, one for the centre-dash infotainment system, the other for the dials you view through the sophisticated three-spoke multi-function steering wheel. These monitors are both 7-inches in size as standard, but can be upgraded - as here - to 10.25-inches in size if you pay extra. 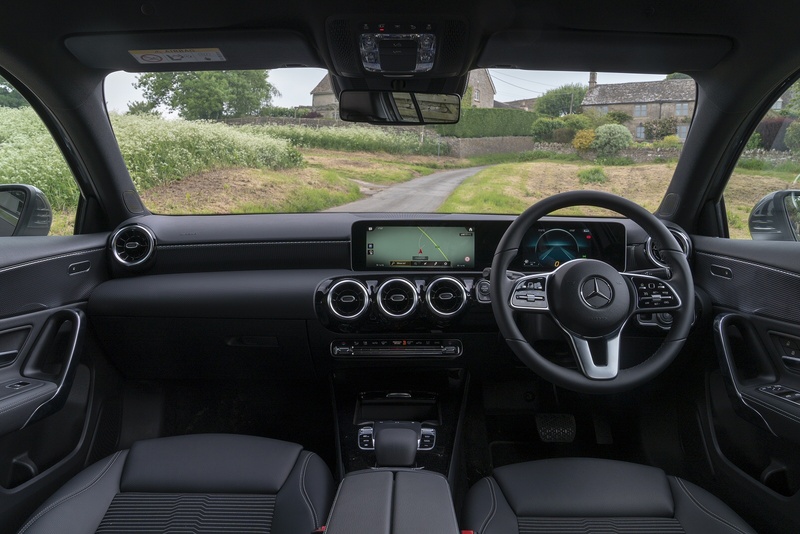 The central one is your main interface for the brand's new 'MBUX' ('Mercedes-Benz User eXperience') multimedia system, which includes hard disc sat nav and the brand's latest - but sometimes rather frustrating - 'Hey Mercedes' voice control system. In the back, a six-footer might still struggle a little to sit behind another adult of similar height but overall, there's significantly more room for knees and legs than there was before. And the boot? 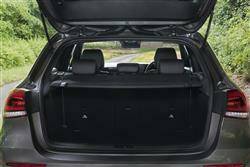 Well at 370-litres in size, it's 29-litres bigger than the trunk of the previous model. As before, most A-Class variants will be sold in the £23,000 to £30,000 bracket. There's a single five-door body style and three levels of trim - 'SE', 'Sport' and 'AMG Line', with an emphasis on the latter two spec levels further up the range. 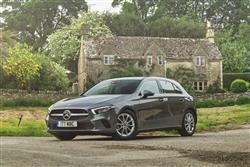 The base A180 1.3-litre 136hp petrol model is your cheapest way into A-Class motoring, but if you can afford to stretch up to and beyond the £25,000 price point, then your options widen. This kind of money gets you either the more sophisticated engine of the A200 1.3-litre 163hp petrol version we tried. 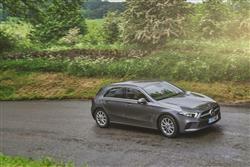 Or what's usually been the best seller in the A-Class line-up, the A180d 1.5-litre 116hp diesel variant. As before, a very large proportion of models will be sold with automatic transmission, an improved '7G-DCT' 7-speed unit. Where an auto gearbox is optional - as it is for example, on the volume A180 and A200 petrol models - it's a £1,600 option; we had it on our A200 test car. As standard, all variants get 7-inch instrument binnacle and centre dash infotainment screens. You'll have to pay extra for an 'Executive' or a 'Premium' pack if you want the larger 10.25-inch screens we tried. Other standard kit includes 16-inch alloy wheels and the upholstery is trimmed in a combination of fabric and 'ARTICO' man-made leather. Navigation's standard too, as is a DAB radio, air conditioning, cruise control with a speed limiter, a reversing camera and a multi-function leather-stitched steering wheel. The A200 in manual form manages 50.4mpg on the combined cycle and 133g/km of CO2, figures that improve to 55.3mpg and 120g/km if you go for auto transmission. The warranty may be an industry standard 3 years but is for unlimited miles, handy to know if you spend a lot of time on the road. As usual with one of the Stuttgart brand's models, there's an ASSYST PLUS dashboard service indicator that monitors engine use and tells you exactly when a garage visit is due. For reference, servicing is usually required every 15,500 miles or every year, whichever comes first. Fixed price servicing is available across the range and most buyers opt for the Mercedes ServiceCare plan that could cost you as little as about £28 a month based either on a two-service/two year deal, three years with three services or four years with four services. Whatever package you opt for, it'll cover the cost of all recommended service items such as brake fluid, spark plugs, air filters, fuel filters and screen wash. 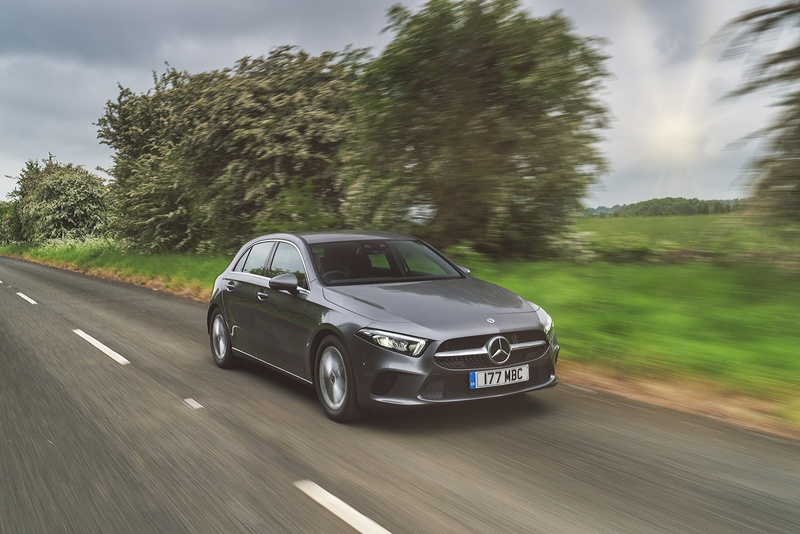 It's also worth mentioning that the optional 'Mercedes me' connect services package includes remote self-diagnostic capability, enabling your A-Class to monitor wear and tear items and alert your local dealer to let you know if something needs seeing to. If you�re looking for a new Mercedes-Benz A-Class A200 Sport Executive 5dr Auto Petrol Hatchback for sale, you�ve come to the right place. 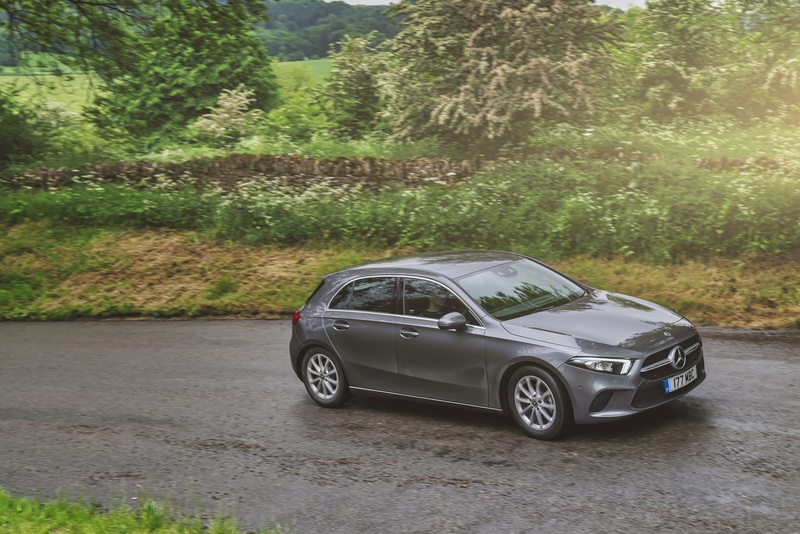 At Bristol Street Motors we don�t just have the best Mercedes-Benz A-Class A200 Sport Executive 5dr Auto Petrol Hatchback deals, we also offer friendly advice and help with all your enquiries to ensure your buying experience is a happy experience.